This is the mode you start in and it is recommended for less advanced users. It allows you to quickly change your overall graphics without having to manually adjust the individual settings. The options for this setting range from Very Low to Extreme. Using a higher option will give you higher overall graphics quality and lower graphics performance. Conversely, setting this to a lower option will result in lower overall graphics quality, but higher graphics performance. If you notice any graphical anomalies such as artifacts, stuttering, choppiness, or tearing, you should try setting this to a lower option. This control allows you to turn your heads up display (HUD) on/off. This control allows you to set whether you want to see the callsigns of other users. This control allows you to turn the mini-map on/off. 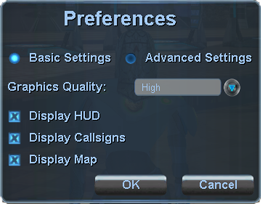 This mode allows you to manually adjust each of the available graphics settings. It is recommended for more advanced users looking to further refine their graphics experience over the options offered under the basic settings. These controls allow you to switch between windowed and full screen mode. For best results, you will want to use full screen mode. 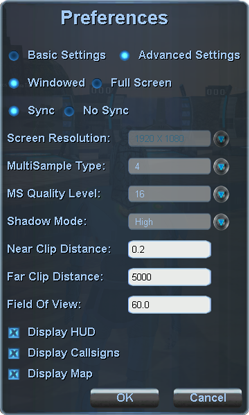 These controls allow you to enable/disable vertical synchronization. Selecting sync prevents your graphics solution from rendering faster than the refresh rate of your display (usually 60 frames per second), while selecting no sync will allow your graphics solution to render as fast as possible. It is recommended that you set this to sync as no sync may result in graphical artifacts such as tearing. This control allows you to set the resolution of the display. Higher resolutions offer better visual acuity at the cost of lower performance. If your display looks jerky, try reducing your screen resolution. Note that you can only specify the screen resolution if you are in full screen mode. In windowed mode, the screen resolution is automatically set by the size of the window. This control allows you to set the type of multi-sampling (anti-aliasing) used by your graphics solution. Anti-aliasing is a rendering technique that is used to smooth the edges of objects in a frame before it is rendered to the display. Without anti-aliasing, edges can have a stair-stepped or blocky appearance (this is commonly referred to as pixelation or “jaggies”). Increasing the multi-sampling type will apply more smoothing to the frame at the cost of graphical performance. Users with lower end graphics solutions will benefit more from a lower setting. This control allows you to set the quality level of the multi-sampling used by your graphics solution. Like the multi-sample type, increasing the multi-sampling quality level will apply more smoothing to the frame at the cost of graphical performance. This control allows you to set the quality level of the shadows rendered by your graphics solution. Increasing shadow quality level cost graphical performance. Users with lower end graphics solutions will benefit more from a lower setting. This control sets a distance from the camera that determines if an object will be rendered. If the distance from the camera to an object is greater than the distance you set here, it will be rendered. Otherwise, the object will not be rendered. It is recommended you keep this at or near zero. This control sets a distance from the camera that determines if an object will be rendered. If the distance from the camera to an object is less than the distance you set here, it will be rendered. Otherwise, the object will not be rendered. Adjusting this will allow you to see more or less distant objects. Rendering more objects results in lower graphical performance.